Baby Hand & Feet Casts - Remember those tiny hands & little toes. Imagine those memories recorded and displayed forever. 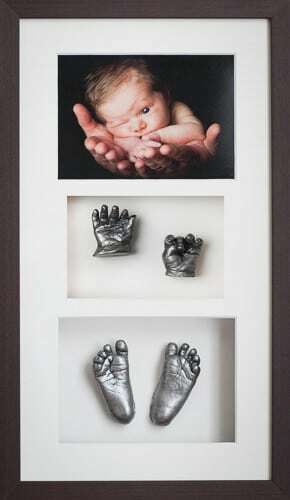 Keep the memory alive of just how little and delicate your baby once was with beautifully framed hand and foot casts. At My Tiny Toes, we specialise in life casting, capturing every tiny detail of your baby's hands and feet by using a quick, easy, completely safe and non-toxic method. Our three-dimensional sculptures form life size replica's of your kids hands and feet. Each three-dimensional sculpture is hand crafted with amazing detail and professionally framed to make a perfect keepsake to treasure for generations to come. Since 2010 I’ve been producing beautiful baby hand and feet casts for proud parents. Also referred to as bespoke keepsake baby sculptures or 3D life casts. I expertly take moulds of your baby’s feet &/or hands which are then used to create life sized casts. These are then framed along with a fine art portrait from just €220. The portrait is taken by me just before we make the tiny moulds and is a perfect compliment to the finished piece. Alternatively, you can choose to not have the photoshoot and either have no photo in the frame or supply your own photo to me to insert in the frame. This way prices start at €165. To see all the options and prices click here. The level of detail captured is amazing and these beautiful unique 3-Dimensional casts make great keepsakes for newborns or babies up to 8 months old (ideally up to 6 months old). A lot of work and time goes into producing each little cast before it is eventually framed along with a portrait of your baby. As a result, the finished product is ready approx 3 weeks after the photos and casts are taken. Frame are available in various colours and casts can be finished in silver, bronze or gold colour. Baby hand and feet casts make great presents so if you are looking for presents for a newborn or baby gift ideas, look no further..!